I have decided to make my TBT posts a main stay segment in my blog. I’ll be posting this every Thursday since that’s really where we post our TBTs. Also, I wanted to document in the world wide web the travels I’ve done in the past, so I think this is a good way to do it. Anyway, for today’s TBT, in lieu with the Malaysia trip that I did back in 2008, we also went to Singapore, which is actually one bus away from KL and where we are actually staying at. Singapore is like my home away from home. Because we have friends and relatives who lives there, we tend to go on short vacations in SG during long weekends, holidays, and even during school breaks. 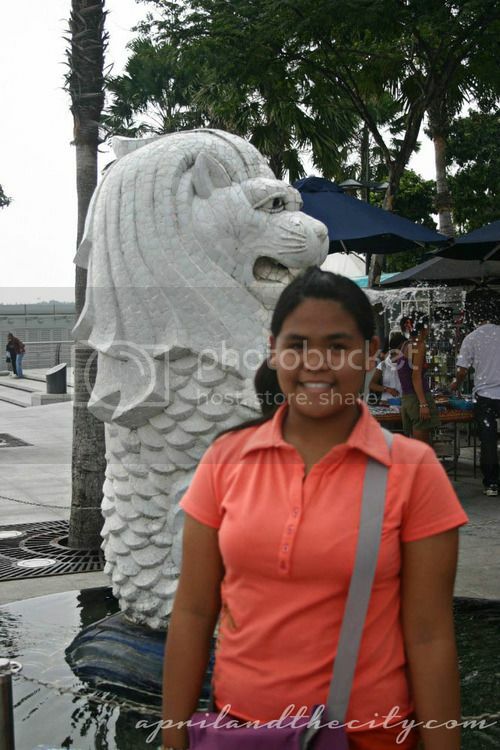 Today, I’ll be posting about one of SG’s famous landmarks, the Merlion statue. The Merlion represents Singapore’s humble beginnings as a fishing village. Its lion head represents the lion spotted by Prince Sang Nila Utama when he re-discovered Singapura in 11 AD, while its fish tail symbolizes the ancient city of Temasek (“sea” in Javanese) by which Singapore was known before the Prince named it “Singapura” (“lion city” in Sanskrit). There are five official Merlion statues in Singapore. Besides the Merlion and the Cub at the Merlion Park, the third Merlion is located on Sentosa Island; the fourth on Mount Faber and the fifth at Tourism Court, the headquarters of the Singapore Tourism Board. Singapore is one of the places in my bucket list.